What my travels have taught me about worldwide wellness. I recently had the good fortune of travelling to the incredibly lush surrounds of the mystical mountain area of Ubud, Indonesia. I’d gone there for a holiday, but it didn’t take long for work to creep into my downtime. As I wandered around, I was really struck by all the therapies and treatments on offer for the westerner. Every street corner offered anything from yoga to the cure for a broken heart; Eat, Pray, Love style. With the westerner sorted, I wondered about the locals. How did the Balinese look after their own mental health? As the CEO of a mental health charity, I was interested to know how mental health issues were managed in the region. 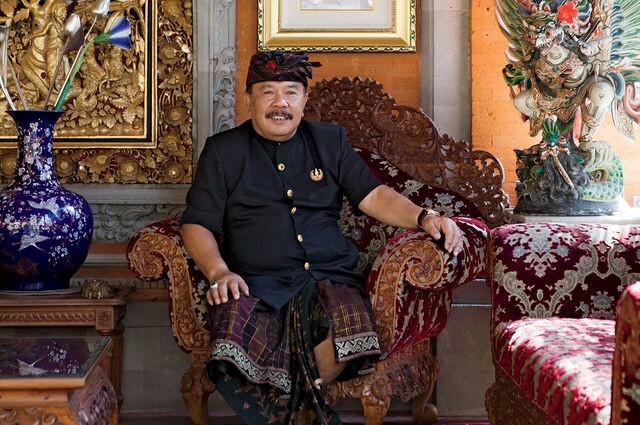 I didn’t know who to ask so I started doing some research and discovered there wasn’t a Minister for Health in Ubud, but they do have a royal family that plays an active role in the community. I was sure their office would know how local mental health issues were managed so I sent an email, and was very surprised to be invited to meet with the Prince of Ubud himself — Prince Tjokorda Gede Putra Sukawati — and at his palace no less! Well I have never met a Prince before so this was indeed an honour! I was full of nerves, especially as I had come to Ubud to relax, but this was an opportunity that I just could not decline. Friday came and I nervously entered the palace. I was taken to a gold-encrusted outdoor pavilion and asked to take a seat next to the Prince’s seat, a stunning ornate red and gold carved timber chair. It didn’t take long for the Prince to arrive from within his palace, and he greeted me politely. There was such a calming feeling about him; he was a tall and strongly-built man, but had such peaceful and wise air about him. He didn’t waste any time, and we began what was to become a conversation that lasted nearly two hours. The Prince explained to me that the people in Ubud are Hindus, and have a very different attitude towards mental health than we do in the west. He was keen to point out that Ubud is considered a very special place — even in Bali — and he has been strong in his resolve to not allow Ubud to succumb to western influences. I asked him how the people of Ubud treat mental illness as opposed to our process of doctors and referrals in the west, and just what sort of advice he would give the west on the treatment of mental health problems. What he told me was simple but profound, and answered both questions. How many traditional mental health professionals in the west would say this? The Prince was keen to point out that a person (in Ubud) with depression is never alone. They have family to support them, and the influence of the environment is also a healing factor. Part of a person’s mental health treatment in Ubud is to sit in the forest and meditate, listen to nature, and a state of wellness will eventually return. To him it was obvious that people from the west have become disconnected from the self and their community. He believes that we have become so engaged in the pursuit of individualism that we have forgone inclusion and connectedness with others. His words were wise. How hard is it to understand that bad food, a failing environment, and a lack of connectedness in the community is killing us? There is no McDonalds or KFC in Ubud, and although there is a Starbucks, the Prince only agreed to it because he wanted the people to see for themselves that it would not fit into the local landscape (and it really doesn’t). This is no home for the soulless franchise food outlet. We spoke about many things in our enlightening conversation, but nothing was more profound than his simple advice. At the end of our meeting he asked me to sit quietly next to him for a few minutes to listen to the breeze and the birds, to the quiet music, and to feel the surroundings and just breathe. I hadn’t felt such peace in a long, long time. The Prince invited me back on my next trip, and to bring with me some of our youth to share how to reconnect with nature, community, and themselves. I accepted his invitation and we said farewell, but not goodbye.